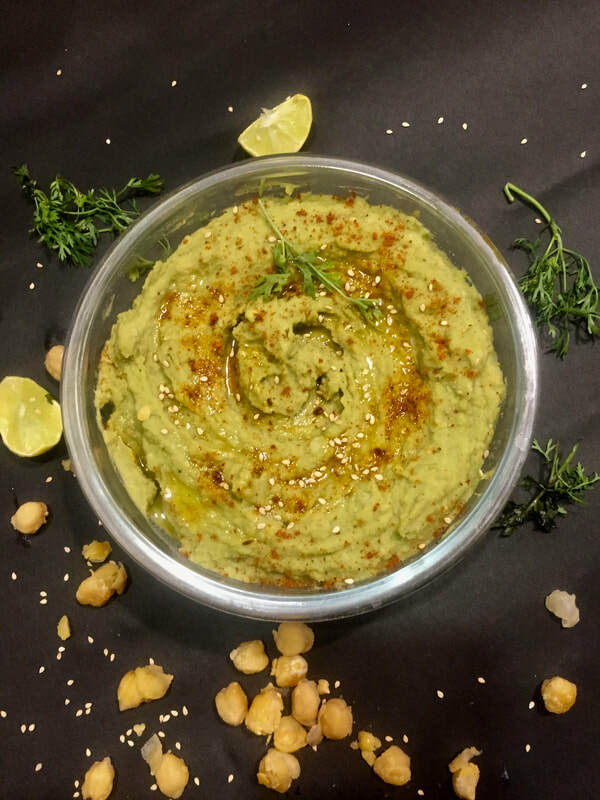 Miracle Superfood Moringa Hummus ! I have been investing a lot of time reading/listening about the the power of foods to eliminate disease and the power of Mind over matter. The brain is a muscle and I am currently focussed on exercising it more and working on my personal growth in terms of my Health+Family and Career in the field of Holistic Health & Beauty as a Lifestyle Entrepreneur. Lately, I have been super inspired to create Vegan recipes using different superfoods in my kitchen. You can follow me on my instagram here , for more inspiration to lead a life filled with purpose, joy and health. In the past, I have made beet hummus, sweet potato hummus and several others, But I strongly suggest, You have some sort of Hummus in your refrigerator at all times, because when you have those unearthly hunger pangs, All you do its cut up some carrots and dip the hummus, spread it on a whole grain bread with salt and pepper or just spread hummus on a tortilla & some cooked beans over it with sliced avacado perhaps with seasonings and chilli flakes and voila, You have an easy peasy lunch ready in a couple minutes. Chilli flakes and extra Evoo on the top. 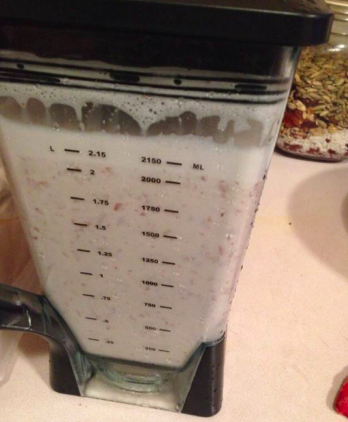 Blend and incorporate everything together in a food processor till it is mixed well. Adjust seasonings and add a dash of chilli flakes and Evoo on top. Let it cool down before storing it in the refrigerator. 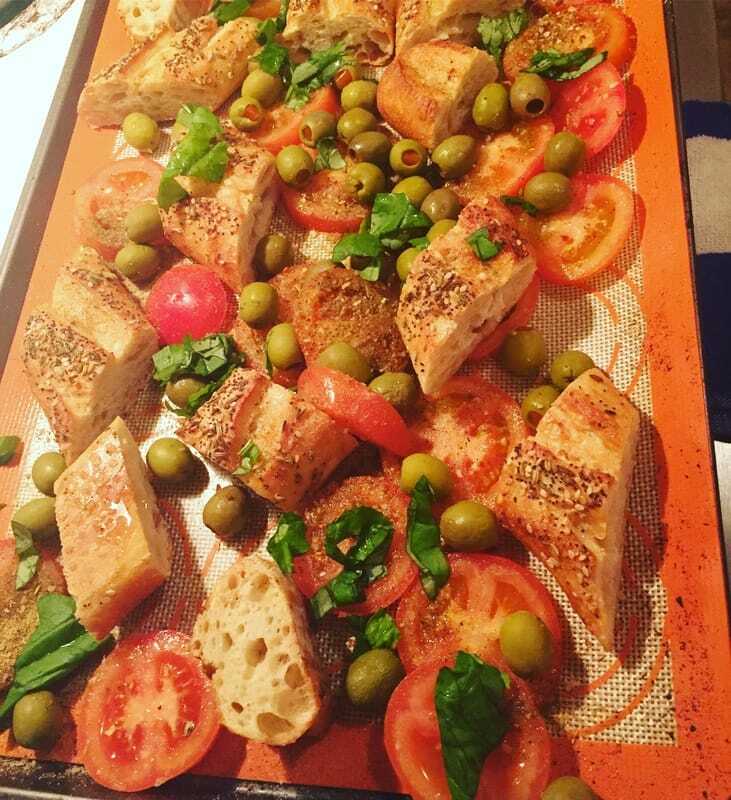 I wholeheartedly hope that you try out this recipe and let me know your thoughts in the comments below or DM me on my Instagram here. ​Now, Now.... I know what you're thinking... Akshita...C'mon....I know you're passionate about health and nutrition.... But Mac and "Cheese" ain't gonna taste the same without duh...."cheese".....Ummmm... I get it guys...That is exactly why I am sharing this recipe because I am about to break that myth..It is super easy to make and tastes...well...as close as the "cheesy flavor" can get. I won't really keep you waiting and will be happy to share this recipe right away. Please let me know if you have a chance to try it out...I made this for the first time few years ago and at that time my son was still used the traditional processed "Mac & Cheese" that they served him at school lunch and I recall that he called my version "YUCKY"....So, I guess this version that I improvised since then might have tasted much better as he gobbled up without realizing that it wasn't really his "cheesy" Mac that he was used to eating at school and other parties he was invited to. Nuf said, Let's get started. * Optional you can add broccoli, spinach, peas and other vegetables to the boiling water to steam to amp up the nutrition of the recipe. Procedure : Cook the carrots and the potatoes till they are soft and fork tender. Once slightly cool, Add them to the blender with rest of ingredients and blend on High, Mix well and blend again till it reaches a cheesy consistency. Serve over pasta of your choice. Perfect for a lazy weeknight dinner. I hope you enjoy and let me know in the comments. ﻿Holiday Warming ginger pea soup! Been forever since I have blogged on here, But if you really want to know what I am upto and all the new stuff that's happening in my life and what's keeping my soul nourished, Feel free to friend me on my IG @glamlocal and my health page @bollywoodyogi ! Yeah, I am a yoga teacher now! All that and more happened in 2016 with a lot of ups and downs like hurting my knee and being bedridden for a few months at the beginning of this year and being able to stand on my head now! Alright, enough with my never ending banter, I am so happy to share this super simple recipe of healing soup that I posted a while on my "stories" on instagram and a couple of my friends wanted the recipe! I have to say, My kiddo who is 8 now loved it and so did people at a party I was at recently! Enuf said, Let's get on the recipe already! Sprigs of coriander leaves and/or basil. Let coconut oil warm up in your pan, I LOVE LOVE my Instapot for all these recipes and more! Once it's warm enough, Add in grated ginger and garlic and cloves, Once the aroma starts to diffuse in your pot, Add in the brown sesame seeds with onions and saute while adding himalayan pink salt, and rosemary seasonings to it. Once it's soft and mushy, add in your thawed peas and hot water along with buillion cube or veggie stock, Stir it in well and simmer for about half an hour, You could add in basil and/or coriander on top if you like or garnish it later. ​Once it is well cooked, Transfer the mixture into a high powered blender and blend away for a nutritious and tasty healing soup. For a more zesty flavour, squeeze in half a lime and serve it fresh off the stove alongside breshly baked crisp bruschetta to wow your family and friends! I hope you make this nourishing soup this winter and let me know if you tried it! Tag me on IG @Glamlocal and/or Bollywoodyogi with your creations ! I would LOVE to see you recreate this and nourish your body and warm up your souls! How to Supercharge your Life! Here are some super awesome ways to SUPERCHARGE your life! Eat your vegetables, Juice it or add it to smoothies, Bake it (Kale chips with brown sesame seeds anyone) or cook it. Dark leafy greens are must in your life! Eat soaked,sprouted,fermented and probiotic foods! eg: Kombucha, Nuts and Sprouts. Cut out processed meat,sugar, wheat and dairy. Right NOW...Okay atleast start to experiment by eliminating them. Drink more water, Trust me you will see a sea of difference in your skin once you start practicing drinking more H20. Better yet set a timer for multiple times a day if you think you can forget drinking while being immersed in work. Stress, Stress, Stress...It is a part of life, everyone has to deal with it, But what you can do with it is to stretch, do yoga ( My drug, My obsession) , practice mediation in quiet for atleast 10 minutes daily and breathe...so many of us forget this activity...Just be still and breathe and see the MAGIC.....literally! Walk outside...barefeet on grass...extremely relaxing..just 10 minutes a day...and laugh everyday...Hahahahahahahaahahhahahaha! Get minimum 8 hrs of sleep everyday and go to sleep and get up at the same time to signal your body your intention. NO screen time like checking your IG, FB feed one last time...NOOO...Every device on airplane mode...Landline is still there just in case anyone needs you in the middle of the night. Think positive, have the half glass FULL perspective, get away from negative toxic environment, Immerse yourself in positive thoughts and emotions and read books by authors that transport you in a different world altogether! And lastly, if you know me well enough, which I guess you do if you happen to read this post, I am a die hard green smoothie guzzler, Don't forget to include atleast one glass to vegetable and fruit smoothie as part of a SUPERCHARGED lifestyle! 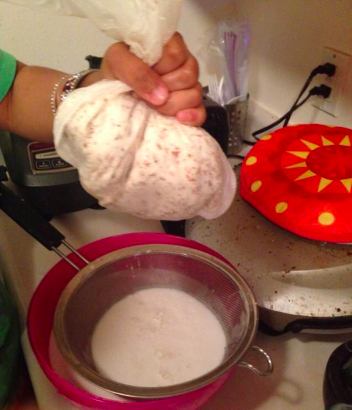 Making Sprouted almond milk is as easy as 1-2-3 and some of you might be a regular at making it! 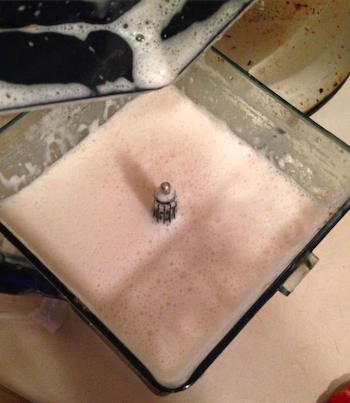 I started making my own almond milk shortly after turning vegan somewhere around 2013, Although I buy store bought almond milk when I know I won't be able to whip up mine at a given time. Silk and 365 organic brand from whole foods are the brands I prefer, But there is nothing close to drinking freshly made delicious almond milk at home, I just wish I could make it as often as I would like. Sprouting almonds overnight is a wonderful way to get even more nutrients out of the nut! 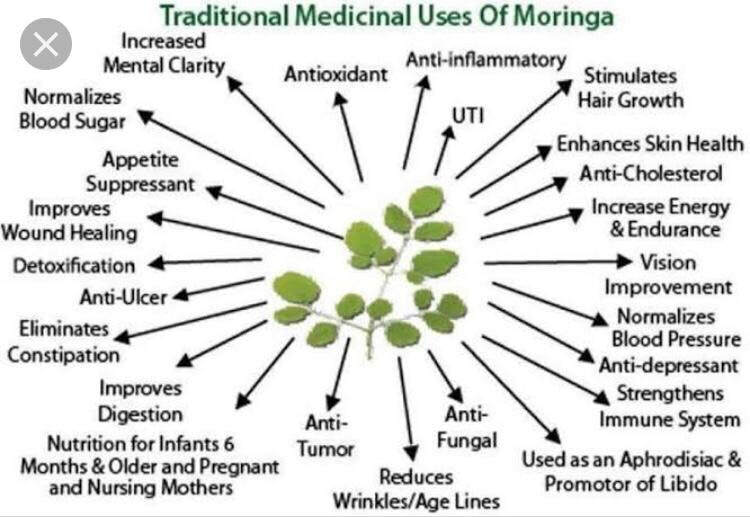 Here are some amazing benefits. Helps with weight loss-The monounsaturated fats in almonds curb your appetite and keep you full. Snacking on them avoid unhealthy binge eating and trigger weight loss. They help in keeping your heart rate healthy and reduce bad cholesterol. Flavonoids present in almonds suppresses tumor growth. The information above must be enough to validate the importance of sprouted almonds in your family's diet. For the recipe all you need is Almonds, some water, pitted dates and non alcoholic Vanilla essence to make slighter sweeter but you can choose to omit if you like it completely raw. 4 cups of water or double the amount of almonds. 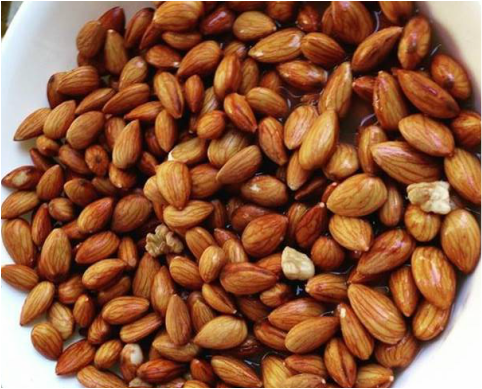 Soak almonds for atleast 8hrs or more, Once they are soaked for the desired time, Add to a blender and pour the water, Then you can prefer to add dates and vanilla extract. Blend and then crush. Once that's done strain it into a wide bowl through a nut milk bag and squeeze all the delicious milk leaving all the pulp in the bag which I like to use in homemade face scrubs or smoothies! And you are pretty much done, Just pour it through a measuring cup into a glass bottle and enjoy it for the week ahead! Let me know if you make some in the comments below. Also, you could follow me on my social networks Fb, IG @Glamlocal and ﻿[email protected]﻿ which I will be relaunching as Glamlocal very soon. It is getting pretty hot in Northern California! Although, I am waiting for fall now so that I can start making some hot comforting soups and stews, I must admit, summers are still my favorite season of them all. My little one has been keeping me so busy all summer long that me time is some sort of a luxury I feel. Friday's my husband offered to take him for a daddy and son day at work so that I could spend some time my way! It is so important to have some downtime especially with summers around and not having to listen "Mommy, what do I do now?! " I am old school and not much of a fan of camps and 5 day lessons. So we have planned a bunch of stuff to do throughout summer with my son's inputs of course and lemonade stand was one of them. I am working on it with him and will share how it went through and our experience with his entrepreneurial streak lately! I made this cool refreshing drink a while ago and totally forgot to blog about it. One kind reader gently reminded me and I totally made up my mind to blog about the procedure although I did not take many pics. Limes & lemons sliced lenghthwise. 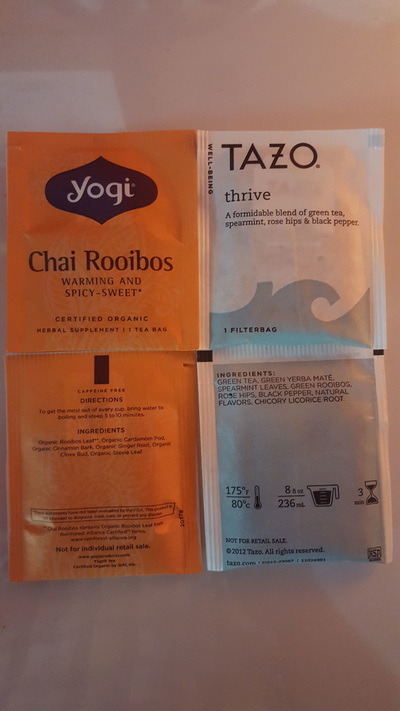 So,the difference here is that SUNSHINE brews your tea! 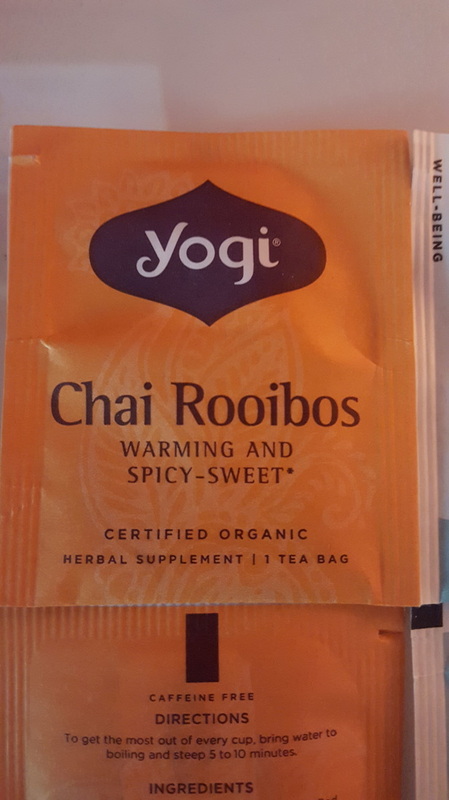 Drop 4 sachets of your favorite tea, I used 2 of rooibos and two of licorice. Let them sit out in the sun for a couple hours. Once they have been out for a while and the jar is warm to the touch, remove the tea bags. Fill a pitcher with ice cubes, slice some lemons and sliced strawberries, I love the citrusy sweet combination of both of them. Pour the warm tea in the pitcher! You can follow my wellness journey on all my social networks below! I will be filming organization videos up next on my channel along with a Part-2 collab on Dollar Tree organization hacks as well. Please feel free to leave your comments, any blog/video requests below that you might have. Sorry for being MIA on my blog for a few weeks now. I have been super back & forth with a few projects with my husband and graduating from International Dermal Institute this week! It's been a whirlwind to say the least, plus we have guests from India! I am loving it, but it's also super tiring at times. Back to the post, if you are new to my blog, welcome! I will take this opportunity to explain my absolute LOVE for Bagara Baigan!! I tasted this dish first time in 11th grade in high school. I still remember that specific lunch break after my botany class where my friend Hira opened her lunch box and I took a couple bites..it's so nostalgic that such a small casual incident is being remembered exactly a decade later so fondly. It was not until I got married, I started to experiment with this dish and till date this is the best tasting version that I have been able to whip up! Our guest at home who is my husband's childhood bestie couldn't stop raving about this delicacy as he had tried it for the first time! 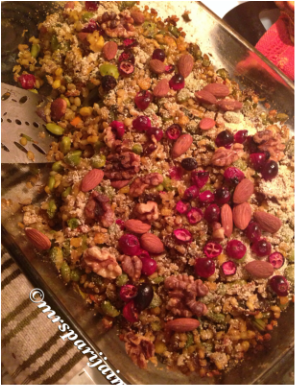 I am sharing a detailed version of this recipe below & I hope your family & friends will love it as much as my family did. Did I say it's VEGAN too! at least 7-8 small brinjals/eggplant slit into 4 quarters,but keep the stem intact. 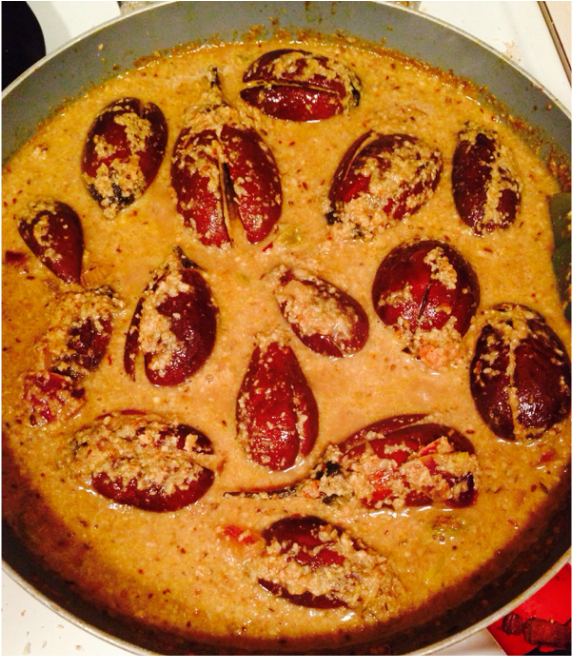 First off unlike my earlier experiments of frying the eggplant or brinjals, I tried baking them to cut the calories. The temp maintained was 375F for 11/2, just be mindful and keep an eye to check the texture with a fork wearing an oven mitt. Meanwhile you can add some oil on a cast iron skillet and roast some peanuts, sesame seeds & Coconut powder or shredded coconut as well, Tossing and turning them often. As soon as you smell the aroma of roasted coconut and peanuts , it's time to switch off the stove, let it cool down and grind a paste in the blender with some water. Once the onions are done, add in the green chillies,turmeric powder,curry leaves and hing along with the fenugreek seeds, cumin powder and coriander powder one by one and let it sauté till the oil oozes out. As, it's cooking for a couple minutes, adjust the consistency accordingly by adding some water. This would be a good time to add tamarind extract to make it tangy and delecatable. Check the brinjals cooking in the oven. It must be slightly mushy by now. Carefully add them to the hot curry at this time. Cover it and let it simmer for at least 1/2 an hour till it's totally done and absorbs all exotic flavors & spices. It is definitely a time consuming recipe and requires some patience, I spent close to 4hrs cooking+cleaning. So that just FYI. But it is well worth the effort and the appreciation that follows is priceless! Once it's simmered, check the salt and other seasonings, garnish with some chopped coriander & serve hot with rice or traditional Indian bread Roti or like me with some quinoa! I hope you give it a try and leave your feedback! Would love to hear your thoughts. Lots of happy & positive vibes! Pie in a glass Smoothie!! Ok, so who likes Ice cream??!! Me Too!! Made this consistently for the past 3 days and my boys are still not over it! It's that DELISH!! It kinda matches my walls. I am obsessed with color! Colorful foodie, Told ya! Little water towards the end if it's too thick. You could also add non alcoholic vanilla extract. 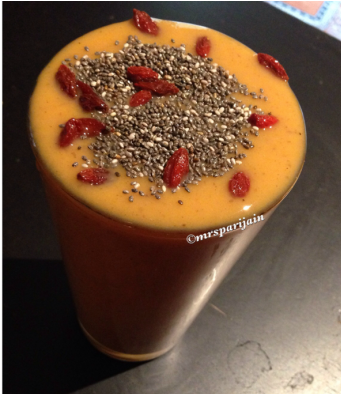 Blend everything and sprinkle Chia & Goji berries. And that's it!! Drink it up!! SLURP!! You can also follow my IG page of you'd like to see all my daily musings throughout my day!! @mrsparijain. Ok, so lately I have been addicted to Vegan cookbooks and busy trying out every recipe in the book and adjusting it according to my taste buds and preferences. I was at the local library last week and had ordered Chloe Coscarelli's Vegan cook books, As soon as I got them, I jotted down all the recipes I wanted to try, if you follow me on Instagram @mrsparijain, you probably know about my obsession with Chef Chloe! I had made Cranberry barley bliss recipe from her cookbook and my family loved it back to back for two days, once as a baked casserole with cashew cream sauce and second has a filling in a burrito with some authentic chimichurri sauce! The sauce turned out soooo good that I had to put it up on my blog!! 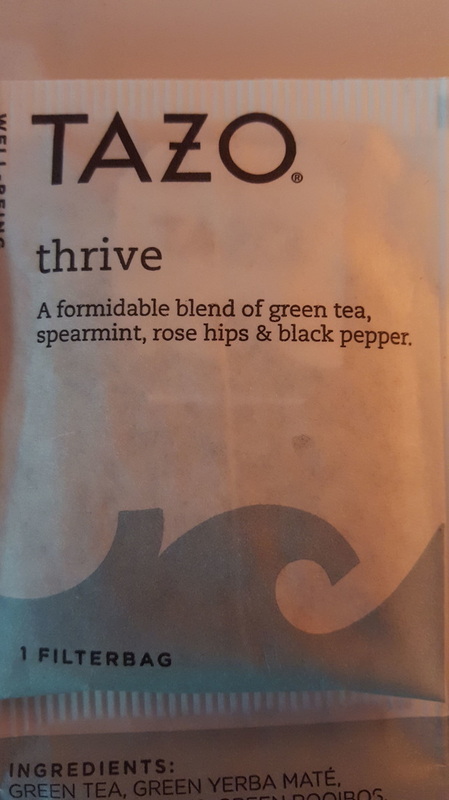 It's a MUST HAVE staple in my house for that spicy kick to just about anything! You all know I post easy peasy recipes that could be whipped in minutes, coz that's exactly my style of cooking on busy weekdays. 1/2 cup olive oil/avocado oil. Just add everything to the blender &...... voilaaaa, the most amazing spread ever!! Whooop!! While everyone is watching( like 1 billion people worldwide!! Yeah!) INDIA-Pakistan cricket match, I am heading to a relaxing foaming Epsom salt bubble bath that is waiting for me!! Hope you enjoyed my post & will give that CHIMICHURRI a try! Actually, I wanted to add more exclamation marks because that&apos;s how I am feeling right now! You know when it rains and you can hear the droplets while you have spa music in the background and warm milk with condiments on the stove that is making the home smell aromatic! 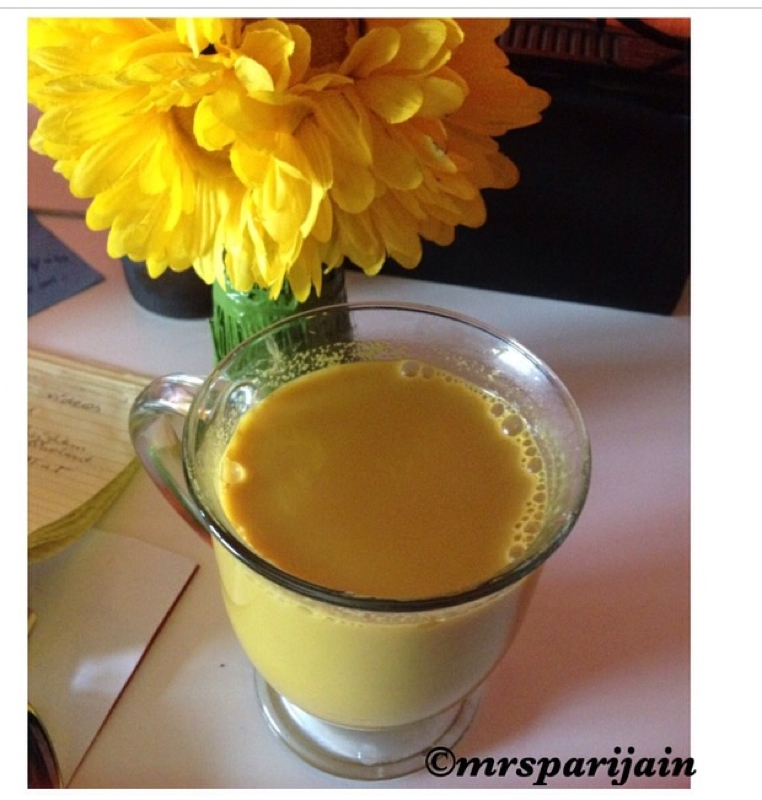 Well, just taking a quick moment out of my rainy day to share a super simple all vegan ofcourse &apos;Golden Elixir&apos; ! Almond milk, homemade or store bought. Everything is to be brought to a boil and simmered for a while in a saucepan! Just looking at all the spices and flavors come together is therapeutic to me! Pour it in to favorite mug and cherish the fact that you have made time for yourself and your body totally deserves all the love & nourishment!! or my youtube channel youtube.com/ajxotica. Born with a purpose to make everyone joyful and happy! One Blog post at a time.